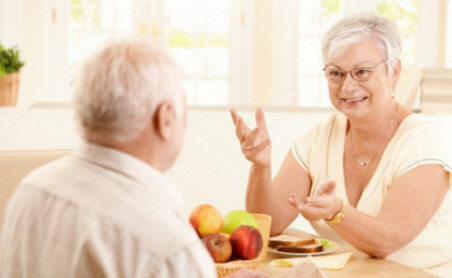 Older people with dementia are especially at risk of eating poorly. Dementia can make it harder to prepare, eat, and enjoy meals. restlessness and pacing can increase the amount of energy (kilojoules or calories) you need to eat. Eating well can help you feel more energetic and live in your own home for longer. Not eating and drinking enough can worsen the symptoms of dementia. legumes (cooked dried beans, split peas, and lentils), nuts, seeds, fish, eggs, chicken, and lean meats. For more information on eating well with dementia, see Alzheimer's New Zealand – Eating well. Keeping a healthy weight can help you maintain your physical and mental health. If you are over 70, losing weight may worsen brain function. Some people find that eating small frequent meals and snacks is easier than eating three larger meals a day, particularly if your appetite is not as good as it used to be. If you notice that you are losing weight without trying, talk to your doctor or other health professional. Your doctor may refer you to see a dietitian. In this case, there is no cost and you will be seen in a clinic or at your home. You can also pay to see a private dietitian. For more information, see How to overcome a poor appetite, How to gain weight, and Oral nutrition supplements. However, if you are having trouble eating enough to meet your needs, your doctor may suggest you take a nutrition supplement such as a vitamin or mineral supplement, or a drink supplement. Talk with your doctor, pharmacist, or other health professional before taking supplements, alternative medicines, or over-the-counter medicines, as these can interact with your prescribed medications. For more information, read Oral nutrition supplements. Keeping your teeth and mouth healthy will help you to continue to eat well. Limit sugary foods and drinks, which can damage your teeth. If you're caring for a relative or friend with dementia, try the following tips. Prepare a large quantity of food, portion it into meals, label and date them, and then freeze them. Set an alarm as a reminder for meal times, and leave instructions on where to find food and how to heat it in the microwave. Leave a selection of finger foods in the fridge (such as mini sandwiches, cheese cubes, cut oranges, carrot sticks, single-serve milkshakes). Leave items that keep well (such as crackers, muesli bars, an apple) in easy-to-see places around the house. Eat together – you can role model and provide prompts for chewing and swallowing. Serve one food or dish at a time, remove distractions from the table, and use plain crockery (no patterns) to avoid confusion. For more practical tips, see the Alzheimers New Zealand page on eating well. Written by Healthy Eating, Healthy Ageing project dietitians, Canterbury DHB. Endorsed by Psychiatrist, Older Persons Health and Rehabilitation, Canterbury DHB. February. Page created February 2018. Last updated January 2019.